Worldwide natural populations of large herbivores are declining, whereas at the same time there are at present many initiatives to bring them back by introducing them in nature reserves. Instead of nature management, this is increasingly seen as a form of rewilding, where the aim is to allow natural grazing and behavior of the herbivores. Also, the diversity of large herbivores that are introduced in reserves in Europe is rapidly increasing, think for example of European bison, water buffalo and tauros, the latter as replacement of the extinct aurochs. There are experiments to reduce or completely quit hunting of deer in designated areas so that they become less shy and more visible for the public. Whereas in other sites, deer are hunted to reduce the perceived nuisance of high population densities. Scientifically a lot is known about the impact of large herbivores on landscape structure, diversity and ecosystem services, but hardly in the context of these rewilding initiatives, where rewilding practitioners are gaining a lot of experience and knowledge of the ecology and impact of large herbivores in different habitats. The aim of this symposium is to demonstrate the state of the art of ongoing rewilding projects in practice and what scientists know about large herbivore ecology and see if and where science and practice could complement and strengthen each other. 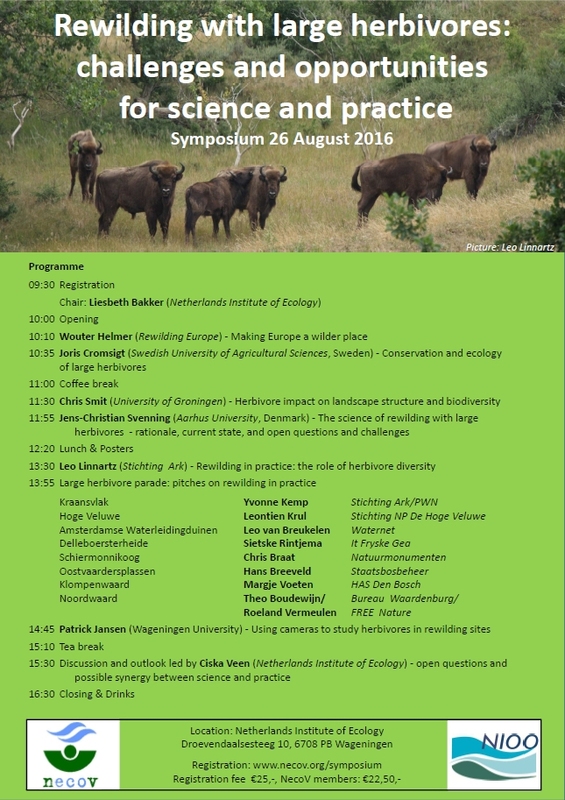 Hence, the symposium is meant for both academics and practitioners working with large herbivores.